These Chocolate Buttermilk Cookies may be some of the best chocolate cookies I've ever had. 2. In a medium bowl, combine flour, baking soda, and salt. Whisk to combine. Set aside. 3. In a large bowl, whisk the cocoa powder and melted butter until very smooth. Stir in the sugar, vanilla, and buttermilk until well combined. 4. Add the flour mixture to the chocolate mixture in thirds, stirring each time just until combined. Stir in the chocolate chips. 5. Scoop cookie dough onto prepared cookie sheets by heaping tablespoonfuls about 2" apart. Bake for 10 to 12 minutes, until cookies are puffed, edges are set, and center is still moist. Mine were just right at 11 minutes. Place cookie sheets on wire racks for 5 minutes, then remove cookies onto wire racks to cool completely. Store tightly covered. Chocolate Buttermilk Cookies may have been taken to these fun parties. Here- would you like to take one home with you? Recipes abound, but the crispy outside and chewy inside is what appeals to me on this one! I've got everything here but the buttermilk - and a 4 year old granddaughter to spend the day with tomorrow. I think I know what we'll be making! They sound delicious and I love anything that is extra chocolatey! This would be a good one to bring to one of the school events where well cookies. Thanks Joy! I have leftover buttermilk, so I'll use it one these. Thanks! I know what I'm doing with that buttermilk in the fridge this weekend! And I think I'll sub some pb chips for chocolate. Pinning! Joy, I pinned this and look forward to trying these. Thanks! Sometimes chocolate cookies... are not so good... but these look amazing. Pinned. I love that these are 100% from scratch. Found you on "Let's Get Real" linky. I am drooling over these cookies. They look so soft in the middle and overall amazing! I am going to have to try these. These look delicious. Pinning so I can try them! I came over from a blog hop. Oh dear. I need to get some buttermilk. It really does make everything better--and I can't wait to try it in these cookies! Oooo....those looks so good. I've been craving some cookies lately so this is perfect timing. Hope you can come and share this tomorrow on Merry Monday. I am trying not to eat sweets, but these chocolate cookies look so yummy. I will save them for later. Would you believe that I have never used buttermilk in cookies?! These look fabulous, Joy! The double chocolate and the crispy-chewy texture is cookie nirvana. :) My chocolate lovers are going to devour them. I just made these. YUM! But boy, they ARE rich!!!!! Joy...you're KILLING me with these delicious cookies. I am salivating over here and don't have any cookies to satisfy myself with!!! YUM-O! :) Thank you so much for linking up at Snickerdoodle Sunday- hope to see you again on Saturday with your latest makes & bakes! Your cookies look amazing! Thanks for sharing with Foodie Friends Friday. Your recipe was #3 with the Most Clicks and will be featured on Daily Dish Magazine tomorrow! Buttermilk makes everything taste better!! Pinned! WOW they look so yummy!!! So often I buy buttermilk, and end up not using it as planned. This would be a great way to be sure it doesn't go to waste ... ! Looks yummy! I can't wait to try your recipe!! You had me at rich, chewy insides! These cookies look so yummy. Thanks for linking to the In and Out of the Kitchen Link Party! Thanks for linking this recipe to Whayd You Do This Weekend, Joy. They sound awesome. I have to make these. Have a good week. Yummy looking as always! Stumbling! Have a great week Joy! These look amazing! Can you ship some out to me? LOL! Pinned so I can try them out this weekend! Stopping by from the Time for Mom hop! These look absolutely amazing! Thanks for sharing your recipe on the Monday Funday Party! Im pinning so I wont lose and checking out Grandma Tenery's too. These look wonderful! Chocolate cookies are one of my favorites! Thanks for the party and stopping by from Wine'd Down Wednesday. Yum! Beautiful photos and fantastic recipe...can't wait to try it. Stopping by from Share Your Cup Thursday. Thanks for the post. Your cookies look delicious! Some of us like crips cookies, and others prefer chewy. This one will be perfect for making everyone happy, and buttermilk always makes baked good better! Pinning. Your cookies look and sound delicious! Thanks for sharing with Creative Spark Link Party. They do look so moist and yummy! Thanks for sharing them with SYC. Isn’t it funny? There are no eggs! I did the same thing- I double checked the recipe for eggs! :) Thanks for coming by, Grace! Those look like my kinda cookie, never seen a cookie recipe using buttermilk before. Sounds interesting. Thanks for linking up to Sweet and Savoury Sunday, stop by and link up again. Have a great day!! YUM, chocolate cookies, what could be better! They look like they are oozing with chocolate. Oh Joy, your Chocolate Buttermilk Cookies look amazing! Pinning and will tweet. I definitely want to try making these soon! Thank you for sharing them with us at the Hearth and Soul hop. Well, change of plans. I bought some choc chips yesterday to make my favorite chocolate chip cookies (Tyler Florence's Big, Fat Chocolate Chip Cookies). But I'm making these instead. 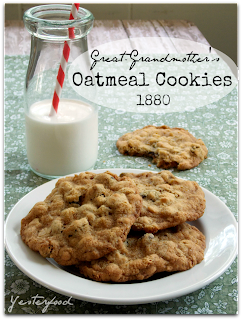 I love baking with buttermilk and have never used it in cookies. Thanks for the recipe, Joy! These cookie are def on my "to do" list. Chewy and chocolaty, my type of cookie combo. Thanks Joy for stopping by and sharing at #theWeekendSocial. I'll be seeing you tomorrow for "Treasure Box Tuesday!" Hope to see you again Thursday 9:00 PM EST. Oh, my goodness! These cookies sound amazing! I love using buttermilk in baking! Thanks for sharing at my Creative Ways Link Party! Hope to see you again this week! Your Chocolate Buttermilk Cookies are coming to my Cookie Jar! This is a fantastic recipe and thanks so much for sharing it with us. Hope to see you again real soon at Full Plate Thursday! These look perfect, Joy! And oh so chocolaty! These cookies have a wonderful flavor. Unfortunately, mine spread quite a bit so ended up very thin. On the positive side, they were very fast to put together and my family liked them. Thank you for sharing the recipe. These sound so chocolaty and scrumptious. I will definitely try these beautiful cookies. Pinning!